But digital lessons ain't cheap. Of the many things we expected to see at IFA 2017, cutting-edge instruments weren't one of them. 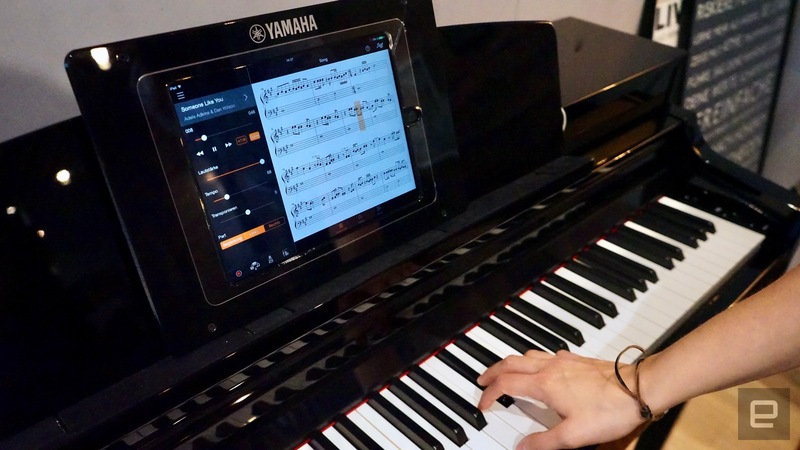 But Yamaha is using its time in Berlin to showcase the Clavinova all-electric smart pianos, which use an iOS device and LEDs above each key to teach you how to play. With the Smart Pianist application, which will also be available on Android next year, you can learn how to play tracks in real-time thanks to blue and red lights that will come on every time you're supposed to hit a key. (Red LEDs are placed above white keys, blue above the black ones.) Not only that, but if you can read music, there's a chord chart being displayed on the iPad in real-time for whatever song you're playing. In terms of Alexa compatibility, Amazon's virtual assistant isn't built into the Clavinova smart pianos. Instead, you're able to trigger different commands by plugging something like an an Echo Dot to them. The only caveat is that you'll need to route that through a MusicCast-powered hub, which is essentially Yamaha's answer to Apple AirPlay and Google Cast. It's not the most intuitive process, but it's still fun to see in action -- especially if it works quite smoothly, as was the case during our demo. For instance, you can tell Alexa to play you a song on your piano, in case you want rather save a few minutes and not browse your music library. Here's the other, and arguably main, caveat: Yamaha's Clavinova CSP models start at $4,000, depending on your piano configuration And if you're feeling adventurous, the company also has a Grand Piano that works with a similar iPad app and plays itself for $60,000. It just depends on how much you want to impress.